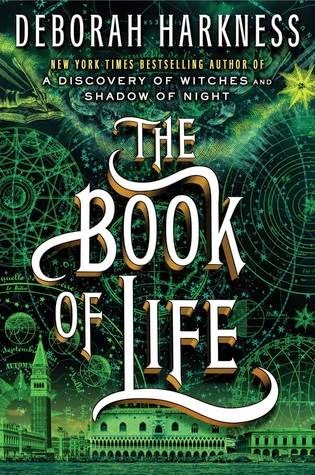 Harkness finally completes her All Souls Trilogy with The Book of Life! If you read my reviews of the first two in the series (A Discovery of Witches and Shadow of Night), you would probably guess that I went into this story with high expectations. I really wanted to be more than satisfied; I wanted to be wow'ed by the conclusion of this trilogy. In this final installment, Diana and Matthew return home in both time and space, and as is their fashion, they do it with an extravagant, yet quiet entrance. They discover that things have changed in their absence. The stakes have been raised. And, it is time that they raise their own if there is to be any hope for themselves and the rest of their family. The Book of Life was a finale that brought the "WOW!" We saw the return of previously loved characters and made me love them even more. Harkness turned the story in completely unexpected ways that left me impressed. Everything about this story went above and beyond my expectations. It never did disappoint. I have my copies of my books sitting on a living room shelf. When I see the beautiful covers reflecting in the light, it reminds me of the magic of this story - a magic that will always hold a special place in my heart! Have you been moved by The Book of Life and the All Souls Trilogy? What are the parts or who are the characters that stand out the most to you? I had some serious issues with the second book, but I really did enjoy this one and the way she wrapped up the trilogy. Yay! Andi ... I loved the way she wrapped it up! She took me by surprise, and that was a completely good thing! Tif, I tend to gloss over books that are about witches and things (unless it's HP! ), so I wasn't really familiar, but I've been seeing this book all over the place, including on a prominent Barnes shelf! Sounds REALLY good! writersideup.com ... If you read a book about witches, this is definitely the one I recommend. It's my favorite of all that I have read! I have nothing to contribute since I have not read the series but I wanted to stop by and say Hi! Hope you are well. October is flying by. I can't keep track of the days anymore. Ti ... Hello! I can't believe that we are only days away from November! I loved the trilogy and the last book really closed up things nicely! I really like Gallowglass but am a huge Matthew fan. I am not sure which of the three I liked best as they all have their own charm. Ciska van der Lans ... I adored so many of the characters! Gallowglass was one of my faves as well as Jack and Marcus. Love those guys!